You all know what a food desert is, right? It’s a place where there aren’t very many supermarkets. In fact, most often it’s a place with no supermarkets, and almost always it’s a poor neighborhood. But why do food deserts exist? Perhaps poor neighborhoods just aren’t very profitable places to open supermarkets. But poor neighborhoods usually have plenty of bodegas and little corner shops, and if those places can make money why can’t a supermarket? What’s more, supermarket executives have always been very cagey when they’re asked about the phenomenon, which suggests there’s more to it than mere profitability. It’s a bit of a mystery. But now there’s another question about food deserts: Should we even care about them in the first place? For a long time, they’ve been a source of concern because supermarkets generally provide better access to fresh fruits and vegetables than little corner stores. Eating well is hard enough for the poor as it is, but it becomes all but impossible if they don’t have convenient access to good food in the first place. Calculator: Is Your Food Spending Normal? Is Walmart the Answer to Food Deserts? 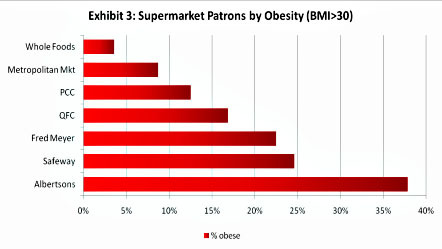 Past research has questioned whether access to supermarkets really has a big impact on either obesity or eating habits, but the question has remained ambiguous. However, it’s getting less so thanks to several recent studies. In one, Helen Lee of the Public Policy Institute of California concluded that children in poor neighborhoods really do have greater access to fast-food chains and convenience stores than children in richer neighborhoods. But it didn’t make any difference: Access to different kinds of stores didn’t have any impact on weight gain among elementary-school-aged children. Albertson’s, a low-cost chain, were far more obese than shoppers at Whole Foods, even though both provided plenty of access to fresh fruits and vegetables. Why does this matter? After all, efforts to make sure that poor neighborhoods have access to a wide variety of food are laudable even if it turns out not to have a big impact on obesity. But it matters nonetheless, because it affects where we focus our money and our energy. If obesity and good nutrition are our goal, we need to look elsewhere. Tackling food deserts, it turns out, probably isn’t going to have much impact. UPDATE: So where should we look? Tom Philpott has some ideas here.